Becker CPA Review vs. Surgent CPA Review are interesting competitors. Becker packs a ton of clout behind its name, being the chosen CPA Review that top-level accounting firms use for their employees. In addition, it is vouched for by all four of the major accounting firms, the “Big 4” as they’re commonly called. In contrast, Surgent CPA Review has a limited reputation, being fairly new to the marketplace. In this article, we will compare and contrast old and new and see how tried-and-true stacks up against fresh and innovative. Surgent has come out of the gate strong by revolutionizing traditional methods of studying for the CPA exam. One of the program’s top claims to fame is using adaptive learning technology in its course. Surgent claims that this cuts down on at least 50 hours of study time for the average student. The first step when embarking on this course is to take a 400+ question assessment test. This test will tell you what you know, what you don’t know, and give detailed explanations as to why you did or did not get questions right. Right off the bat, you’ll know where to spend the most time studying. After that, Surgent analyzes your results, customizing your study plan and future quizzes/simulations to adapt to your specific needs. This makes for the most efficient use of your time, drastically reducing your study periods. Becker now offers a similar feature, called Adapt2U Technology, that reads your assessment test and tailors a program of study for you to maximize study time on your pain points. Becker also includes regular progress checks to make sure you’re on course and retaining the information you need. As anyone familiar with Becker will note, Becker is one of the most expensive CPA reviews on the market. In fact, because Surgent is much lower in price, Becker comes in at almost double the cost. Willingness to pay for Becker’s program is in the eye of the beholder; after all, you’re most likely paying for the prestige and gold standard of a company that’s been around for a long time. This is in addition to being a comprehensive CPA review course, naturally! However, many individuals taking the CPA probably don’t have their company footing the bill. If you’re going it on your own to get your CPA certification, a more cost-effective program might make sense for your situation. It is worth noting that Becker does offer seasonal discounts. For example, you can get $1000 off your course costs in the month of December if you’re paying for the program out of pocket. If you want to spend your money on a professionally-endorsed brand, pick Becker CPA Review. Otherwise, Surgent CPA is the clear winner for tech-savvy students. Becker offers a unique video solution to common pains, which we certainly appreciate! If you’re working through a task-based scenario and are just absolutely stumped, you can hit the CPA SkillMaster button. This new feature will take you step-by-step through the problem under the guidance of a CPA expert. It’s like having your own private coach! In addition to this feature, Becker makes it’s video content as informative as possible, with its friendly video host often citing real-world scenarios and examples in addition to those featured in the text. Let’s face it: any video concerning CPA practices probably isn’t the most engaging out there. However, Becker tries it’s best. Surgent features shorter videos, many of which feature Liz Kolar. She has over 25 years of experience in teaching accounting and CPA review courses. Kolar makes for a great host as she is passionate about the content and manages to deliver it in an interesting and concise way. In our opinion, that makes learning about CPA practices just a little more bearable. Becker’s software now offers unlimited access! While their original course access period was limited, they now give students all the time they need to complete their study materials. Regardless, Becker is still well-suited to those who can learn and execute CPA exam concepts fairly quickly. Surgent happens to offer a money back guarantee if you don’t pass the CPA, but Becker also offers a guarantee called the Becker Promise. Students who pass the course but fail the exam can retake the course for free (although they will have to pay for course materials in each section). With both programs, they are willing to put their money – and yours- where their mouth is in terms of delivering a quality product that will prep you for the CPA exam. 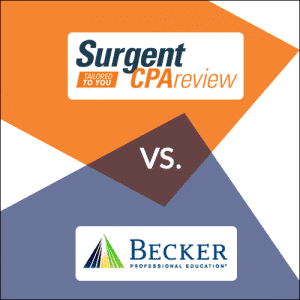 Becker and Surgent are both quality CPA review courses, and potentially serve different students with different needs. Surgent offers a quality course with a low price point, and Becker carries a venerable name that is trusted by top accounting firms in the world. If reputation is of less concern to you, and you don’t mind a newer CPA exam product that will get the job done, Surgent might work better for you. However, if you’re looking for a tried-and-true, trusted CPA review course through your work or with the hopes of eventually working with a top firm, Becker could be a major feather in your cap. You can check out our full review to get all the details for both Surgent and Becker. We’ve also got the best discounts to make buying Surgent even easier. Good luck! TAKE ME TO SURGENT CPA REVIEW! I used Surgent to review for Reg. In their orientation video I believe they said when your trending score gets to 75% you're ready to take the exam. I watched every video, made and studied note cards on each, did all the MCQ and Sims. My trending score was at 91%. I took a practice test and finished in only 2 hours 10 minutes and scored 94. Well, I took the Reg test today and was so disheartened. There were many, many things on that test that were not even mentioned in the review. I could not have prepared more and yet I''m certain I did not pass. At this point, I am either going to purchase a new review course or maybe just go a different direction. But definitely would not recommend Surgent. Save $900 on Surgent CPA Review Ultimate!